Are you a woman with type 1 or type 2 diabetes who may be considering pregnancy in the next 1 to 5 years? 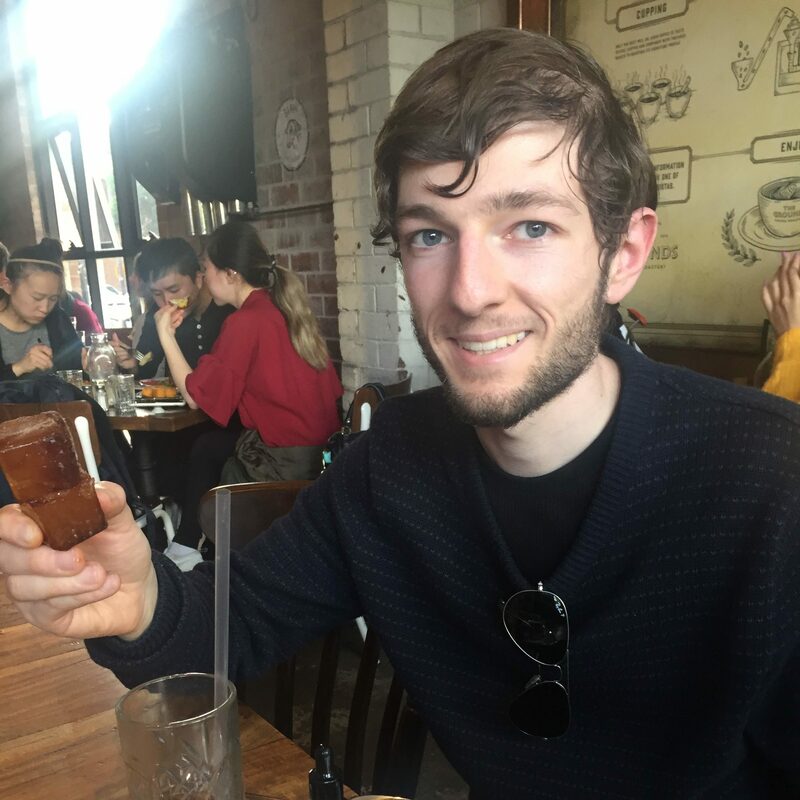 My friend and longtime T1D blogger Helen Edwards of Diabetes Can’t Stop Me is looking for some women to help out with her PHD research, and today I’m lending her my blog to share some of the details of this research. We are developing a Contemplating Pregnancy in Diabetes Support Tool to determine preparedness for pregnancy. 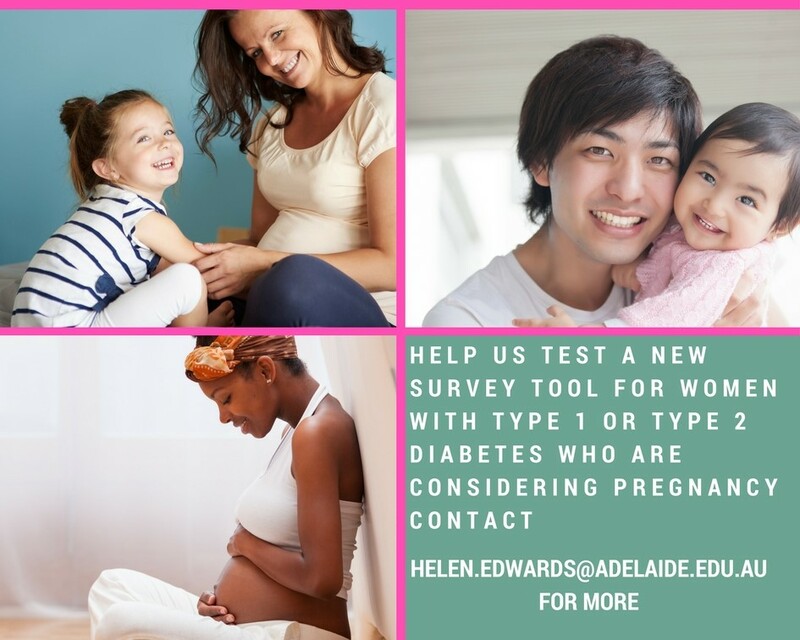 The aim is for the tool to be used by diabetes health care providers with women with type 1 and type 2 diabetes, when contemplating pregnancy within the next 1 – 5 years. Pre-pregnancy counselling can help women in planning their pregnancy. However, lots of women do not attend pre-pregnancy counselling for different reasons. This can include not knowing the importance and usefulness of pre-pregnancy counselling, not having access to this, thinking they already know all they need, or having past negative experiences around pregnancy information. The survey tool aims to help with increasing awareness about the importance of pre-pregnancy counselling and encourage women to attend this when ready to plan a pregnancy. The survey results would be used to have a discussion about how the health care team can best support the woman to take steps towards planning a pregnancy at some stage in the future. Even if she is unsure if she wants to have a baby one day, it is a useful exercise to find out more about what may be important. The tool would be used in a cycle of care, such as every 6 – 12 months when visiting her doctor or diabetes educator. A small number of women will then be invited to participate in a video interview via Skype with Helen Edwards. We will randomly select these women, and invite them to join. If agreed, the questions for the interview will be provided to you prior to the interview, and Helen will then set up a time that suits you to carry out the interview. We expect the survey to take you no more than 30 – 45 minutes to complete. There are no further requirements unless you are one of a small number of women who are invited for an interview. If so an interview will take about 2 hours and will be conducted online. Helen is a longtime T1D and an amazing advocate who has given tirelessly to the diabetes community here in Australia. 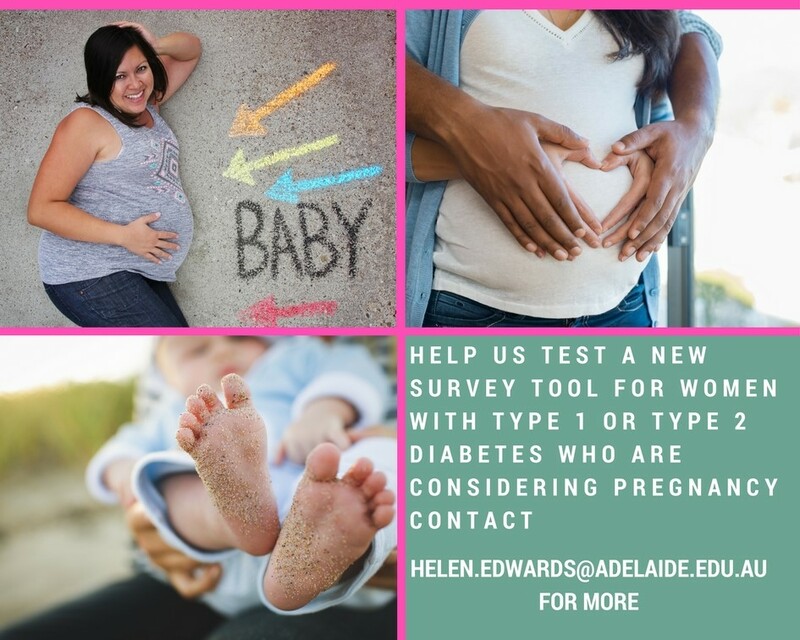 If you are able to help her to help other people with diabetes, please get in touch at helen.edwards@adelaide.edu.au. And please do spread the word!